The need to create a common brand experience across the digital experience on and offline Marketers have been advised to create and tailor different formats of content with customized copy for highly fragmented marketing channels from TV and print to various social media platforms in order to reach their target audience. Customers expect to access and consume information across platforms, apps, and devices. What we will see though is a more conscious effort to bring disparate groups to the table to learn how to collaborate across screens, channels, and moments of truth to deliver ONE experience to customers wherever they are in the lifecycle. “The Internet of everything”There is a vast change on our horizon that will be led by augmented reality and wearable technology. As the web adapts to and adopts these new realities, it will drive innovations that help businesses stand out. Digital marketing will continue to adapt and promotion channels will be further split along device lines. Boosting consumption of content Creating great content and driving traffic back to your site will remain the best way to generate organic leads. New apps and filters are emerging to help consumers make better content choices. One example is Zite, which filters content for you as it learns about your preferences. With content marketing reaching saturation, the marketer’s attention will turn toward the new challenge of getting messages through these new filters. The focus on reporting, testing and optimization make content production and content distribution as important as content generation itself. “Native” advertising Ads that match the form and function of a particular website will involve mixing paid media with owned media to accelerate content distribution. We have all seen the promoted posts on Facebook. Currently, many popular and influential content marketing platforms are used to power native advertising campaigns. The push will come from customers not getting disrupted from their online experience and social networks pushing businesses to pay for access to their platforms. Facebook plans to stifle organic promotional posts in the news feed starting in January 2015, and Twitter hasn’t ruled out implementing a Facebook-like algorithm for their news feed. Also, Focus would shift from solely promotional to relevant and interesting content, even outside social media. Social Video contentYouTube, Instagram, Pinterest, Tumblr, and Vine will play a greater role in marketing strategies, but so too will infographics and data visualizations. 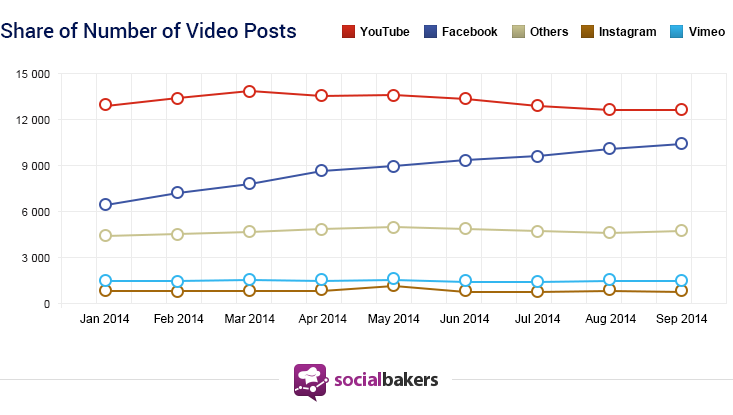 As can be seen by the pic from Social Bakers, Facebook is catching up with YouTube as the preferred medium of Video sharing. The social networks will give extra exposure to uploaded videos on their own sites because they keep users on the platform longer and provide unique advertising opportunities. “Reactvertising” The need for responding as quickly as possible to news and current events in an effort to stay top-of-mind with consumers has reduced the time required to produce product marketing to a matter of seconds. So we now see marketers react to events by releasing ads quickly, as if by reflex. We expect to see more real-time marketing and live-tweeting as marketers with big content teams continue to strive for social media relevance. Marketing analytics will bloom Marketing data will become a crucial point in any marketing endeavor and its acquisition will be easier and faster. Consumers and marketing activities will generate a vast amount of detailed information and companies are expected to use specialized software to help them in making sense of the data at hand. Marketers will also become more interested in correlating their spend on content marketing to a more measurable impact on overall sales and ROI, and technology partners will start to offer the means to measure that impact. Marketing campaigns will be more data-driven and more personalized We now have the tools – using cookies, algorithms, and programmatic marketing – to run huge automated and Hyper-Targeted campaigns more intelligently. There is an opportunity for marketers who would like to stay ahead of competition online by investing not only on content but also on building relationships, which will drive brand strength. Digital marketing will start to be accepted by B2B manufacturers As purchasing managers spend more time on the social networks, businesses will look to promote on social media, direct traffic back to their site, introduce a call to action, and then drive the lead through the conversion. SlideShare could emerge as the key social network for business professionals to find and share bite-sized pieces of content. We can also expect this to lead into more QR codes, texting campaigns, and spam emails. The microsite in brand gTLDs (generic top-level domains) A brand TLD provides the opportunity for branded corporations to use their corporate name as their website’s top-level identifier instead of using a more traditional .com or .biz domain space. Many are preparing to launch new campaigns or microsites in their new spaces rather than full redirects of the home page. The applications of this are huge and will allow big brands to leverage the brand value they have built over the years. By looking at the above interesting trends for 2015, it won’t be incorrect to say that all those enterprises, which have a clear and contextual strategy for creating, cultivating, and managing the content, would have an edge in comparison to their immediate competitors. And like 2014, this New Year is going to be content rich too.